The aim of the Remote Sensing is twofold. 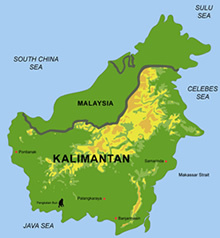 It is planned to produce - a basic ecological and land use map for the whole area covered by peat in Kalteng using LANDSAT TM and ERS-1/2 SAR images. From this map it will become evident where the peat depth is small and agriculture will be feasible and where the peat is to deep for such activities. - a change detection map and a fire monitoring system from multitemporal ERS-1 image series, which allow to analyse the loss of forest due to shifting cultivation and uncontrolled forest fires.This knowledge will lead to improved land use planning measures and fire prevention. Reference: Boehm, H.-D.V., S. Haisch, E. Friauf (1995). "Environmental Helicopter with Modular Sensor Concept: Example on Forestry Monitoring", presented at the Conference on Remote Sensing and GIS for Environmental Resources Management the Indonesian - European experience, Jakarta, June 6 - 8, 1995, Session 15.